WE are thrilled to announce that the University has won the Student Experience Award at the inaugural Guardian University Awards. 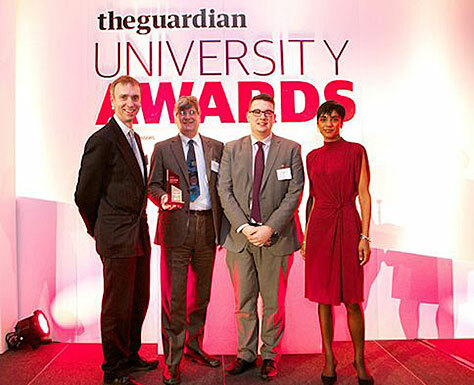 Presenting the award last night, BBC education correspondent Reeta Chakrabarti said MMU’s project to improve the academic experience, called EQAL, had been “ambitious in its pace and scale” and was “quite exceptional”. EQAL has seen MMU transform its undergraduate curriculum, processes and learning technology to improve student learning and satisfaction, and led to a six per cent jump in satisfaction in the National Student Survey. Vice-Chancellor Professor John Brooks said EQAL had “helped put the student academic experience at the heart of everything we do” and said it was a very proud day for everyone to win the first ever Guardian ‘Student Experience’ award. Reputation“We are truly thrilled with this award which helps confirm our reputation for teaching and learning excellence. Student President Ben Atkins said: "We are delighted to see the university get the recognition it deserves for this excellent work. It’s a great reflection of the strong partnership that exists between the university and its students." "It’s a great reflection of the strong partnership that exists between the university and its students." EQAL began in 2010 with detailed analysis of student feedback into all aspects of their learning. New curriculum rules were agreed, assessment slimmed down, and module leaders set about rewriting the entire undergraduate curriculum. Technology was chosen to facilitate student engagement and ensure learning resources could be ‘wrapped around the learner’. An electronic workflow was developed for capturing, reviewing and approving modules that populated the student records system, timetable and new Moodle VLE. In September 2011, an entirely new first year curriculum went live supported by Moodle which delivered the information students had been asking for. It became an instant success, peaking at over 400,000 hits a day. Delivering seamless, personalised information became a key objective of the EQAL programme and MMU won funding from the JISC to pursue ground-breaking work to assemble personalised information at institutional scale. Technological innovation was matched with process innovation to introduce personalised timetabling and submission schedules orchestrated by Bruce Levitan's Business Improvement Team and managed by a host of managers including Phil Range, Gwyn Arnold, Penny Renwick, Peter Dunleavy, Alexander Thorley, Peggy Cooke and Penny Sweasey. “It is great to see how the University can come together to make a step-change improvement in student experience,” added the Professor.